For the carnival is over. Now the harbour light is calling. 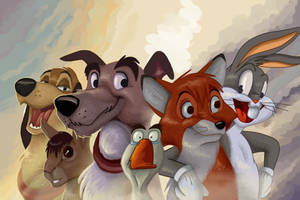 A small compilation featuring some of the most forgotten Disney animal films of all time. The selection of characters was based around the simple; yet thought provoking question: When was the last time you consciously and willingly decided to sit down and watch one of these films from start to finish? If the film was featured on TV and you decided to watch it, it doesn't count, it only counts if you really wanted to watch the movie, so you rented, bought or watched it from your own film collection. I know some of you will be able to say that you watched some of these recently, but i also know that most of you would honestly say 'not for a very long time', if ever for some of you. As for me, i own Lilo & Stitch, Brother Bear, The Emperor's New Groove, Oliver & Company, and The Fox & the Hound all on DVD. So i do see these films often, but i can imagine that most people don't. I should also mention that the characters here don't represent themselves, but more so the films in which they came from. Now this one i know will cause the most confusion. Because i know that Stitch is EVERYWHERE! But that is solely due to the anime show that Japan created for him simply called 'Stitch!' ever since Disney sold Stitch to Japan; he has been manufactured like crazy. But like i said earlier, he represents the film; not himself. The film 'Lilo & Stitch' these days has more or less been forgotten. The animated series has been cancelled, the sequels flopped, and Lilo has been rejected and replaced by some other anime chick. So yeah, technically i should have placed Lilo here instead of Stitch, but i can't draw human characters to save my life! Pretty self explanatory if you think about it. I loved this movie, and i still do. But this was a film that i can imagine wasn't supposed to be taken too seriously, kind of a 'joke' film or a parody of a well known tale. So it wasn't surprising that it pretty quickly lost its popularity. A lot of people from my generation don't really remember this movie. Disney tried to reprise it with a sequel and an animated TV series, but i don't think they did too well. Sorry Kuzco! I really liked this movie, but much like 'The Emperor's New Groove' its popularity was pretty short lived. Which is a shame, because i think it deserves to be up there with the classics. I know a lot of you would disagree with me on that note, as i've recently found out that not many people actually like this film. Oh well, i still do. And I don't really know what happened to this movie, but before i knew it 'Brother Bear's' fame was gone and soon it was virtually unheard of. It did have a sequel but...it sucked. As most Disney sequels do. One of the many examples of a Disney film burdened by it's age. It was a beloved classic then, however now it's a forgotten one. Most of the newer generations have never seen it and don't seem to care. It did have a mid-quel, but i don't even want to acknowledge it's horrible existence (yes it's that bad) honestly it was the worst Disney sequel i have ever seen! And it flopped anyway, so no one cares. The oldest of the lot. Now i know that the character is still quite memorable, and some scenes are too, like the controversial 'Pink Elephants On Parade' scene, that people seem to think is a reference to an acid trip. but come on... when was the last time you actually watched it all the way through? Think about it. For me at least, it's been a very looooong time. No doubt your parents' generation would remember this film pretty well. But not ours, once again, it's age is most likely to blame. To be honest, i don't think i've ever watched this all the way through till the end. Probably one of the most forgotten Disney films of all time. This film had no sequel, no TV series, no commercial celebration upon re-release, very little merchandise, and get this; when i listed all the Disney films i could think of one day at school, everyone who saw the list mentioned that they had never heard of this movie. And for once, i don't think it's age is the reason. But for the life of me, i don't know what is. So people please, for their sake and yours, watch at least one of these classic Disney movies today, and make them live again! Because NOTHING hurts more than being forgotten. Your inner child is calling, answer it! Aww! Those underated movies not that much people talk about! don't know how people forget it really, I've always remembered them, even if I don't watch them often. Most newer generations don't seem to care at all, and most older generations forgotten everything and later die out without even caring, so there's no point in remembering or even missing. Everything happen this way not by time or nature but choice. STITCH SHALL NOT BE SAD!!!!! 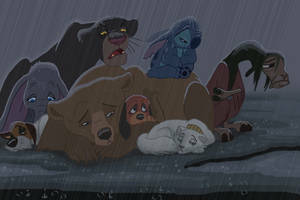 Cheer up Bagheera, you got a cool remake where you were played by Sir Ben Kingsley! I'm crying when i think about it. It was great. I fondly remember Yzma's famous lines 'pull the lever Kronk...' favorite scene still today. I like many of these fims, (and their sequels) but I haven't seen them in a long time! Thanks for reminding me about them! Little late to the party.. but I practically own every good Disney movie on VHS and I try to watch a few a week if not more. I never stopped watching them simply because I never let my inner child grow up. 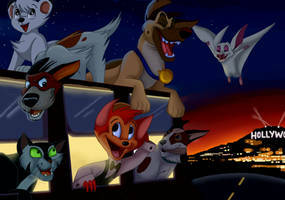 Oliver and Company is one of my favorite movies and makes me cry every time.. it's such a beautiful movie.. and all of these films.. I watch how beautifully their animated and appriciate all the work put into them and just how fun they are. 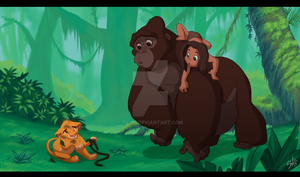 And I remember when Tarzan came out.. still a favorite to this day. But I loved watching the jungle book as a kid Bagheera and Shere khan are my to Favorite charaters in disney as a kid and today ! If wasn't allergic to them I would take more than just dumbo with me. Yeah... they're rather underrated movies. The truly funny thing is over the last 3 years, I've wanted to sit down and run through my childhood nostalgia... but I no longer have a working VHS player. I'd have to literally go out, and buy them on DVD or Blu-ray (IF they even have such a release) and watch them that way. Shame isn't it? The Aristocats was my favorite movie as a child, I watched it all the time over and over again. As I have now grown up I still have fond memories of it today. How can any of these be forgotten? I always rewatch these movies (and 'Spirit: Stallion of the Cimarron' which I believe is a Dreamworks film). I think the only one I've failed to watch again was the Jungle Book. They are my all time faves, I own all the movies, have some merch relating to them and have forced my little cousins and younger brother to watch them as well. Sad to think that they have been forgotten by others. They will always remain in my heart. I just recently saw the new Jungle Book! It was so awesome good way to remake a classic!!! Maybe I'm weird, but I seriously watch most of these once a year. Not a huge fan of Aristocats, so I exclude that one. I seriously watch the rest probably once a year. I prefer the non love story, non prince/princess animated Disney films. I've seen most of these films all the way to the end, especially Jungle Book and Dumbo, and I've loved all of them. Those two definitely won't be forgotten. 101 Dalmatians actually is pretty darn loved along with Hercules and Tarzan though. I have Brother Bear on DVD.